Three WS 8th graders presented their science fair projects to the WS School Board on May 9, 2016. All three of these students went on the the Vermont State Science Fair in March, (after being selected to represent their school at the WS Science Fair in February). Virginia Snyder's project was entitled How Does Different Kinds of Music Effect Heart Rate? One of her findings was that songs that people know made their heart rate increase, but it happened with both slow and fast music. 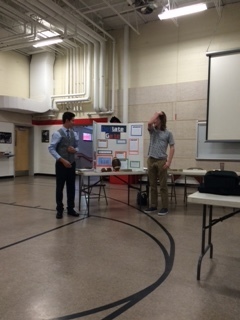 Elijah Milligan and Zackary Bourque worked together on Deflate Gate, which they presented together at the meeting on the 9th. Their question was Could Weather Impact the PSI in a Football? Their conclusion was that balls can deflate in extreme weather conditions but the weather was not exceptional at the AFC Championship in 2014 when the footballs were found to have lower PSI than regulation. The two gentlemen concluded that it was intentional tampering. 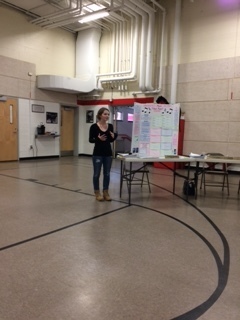 Both presentations were remarkable and greatly enjoyed by the audience and the school board.